Originating on the remote island of Crete, and surrounded by other ancient empires in the Mediterranean, it’s easy to see why the Minoan Civilization is overlooked. Its influence, however, would leave behind a far-reaching and enduring legacy that included the arts, navigation and the first written European language. Also, as a point of distinction, they should not be confused with the word ‘cretin’, which refers to an idiot. Much of what we know about the advanced culture is attributed to British archeologist Sir Arthur Evans, who named the civilization for the Greek mythological deity, King Minos (the son of Zeus and Europa). Like most of the indecipherable Minoan language, what they actually called themselves remains a mystery. Evans’ findings did reveal an island that had been continually inhabited since the Neolithic period (c. 7,000 BC) and gradually evolved into a society brimming with creativity, organization, and in harmony with the natural environment. In the early 20th century, the esteemed antiquarian led several excavations and classified three distinct Minoan eras (Early, Middle and Late) eras. Evans later subdivided his treatise, e.g. Early Minoan I, II, III (EMI, EMII, EMIII), the first of which began around the 3rd millennium BC and helped usher in the Bronze Age. Eventually, the Minoans’ impressive 1,500-year dominance came to an end around 1450 BC with the arrival of the Mycenaean Greeks. A steady influx of invading forces would come to occupy the land over time, including the Romans, Byzantines, Ottomans, and Nazis. Today, Crete is part of Greece and represents the country’s largest island (125 miles east to west), serving as a popular tourist destination with its abundant ancient sites and artifacts — all of which proves categorically that no empire lasts forever (and why history matters). According to Greek mythology, King Minos was given a magnificent snow-white bull from the sea god, Poseidon. But when Minos failed to sacrifice the animal and instead kept it for himself, the water deity took revenge by having the bull seduce the ruler’s wife, Pasiphae, who then give birth to a half-man, half-bull creature. But that’s not even the freakiest part of the story — it gets much weirder — but at least you’ve been warned. Following the murder of King Minos’s son, Androgeus (a dominant Jim Thorpe type of all-around athlete), a war led to the defeat of the guilty Athenians. Minos then demanded reparations in the form of seven young men and seven young maidens; per terms of the settlement, the teens would be sacrificed every seven years (or nine years depending on the version) by being fed to the ferocious, flesh-eating Minotaur. Adding to the punishment, the beast now roamed in an inescapable maze-like enclosure called a labyrinth, created by the famous architect-to-the-gods, Daedalus and his son, Icarus. By the time the third sacrifice rolled around, Theseus, the King of Athens’ son, volunteered to put an end to the slaughter and slay the bull himself. Upon arrival, Minos’s daughter, Ariadne, fell madly in love with the Athenian prince and helped him kill the Minotaur (her half half-man, half-beast brother) by giving Theseus a spool of thread so he could find his way out. Finally, to make a wonderfully twisted, salacious story short(er), Ariadne and Theseus broke up, Icarus died by flying too close to the sun, and King Minos was boiled to death and eventually turned up in the underworld, where became a judge in Hades. Well-crafted ceramic pottery, metal-work, and colorful fresco murals characterize Minoan art forms. A deep surplus of unearthed relics reflects a strong artisan class whose efforts became increasingly more vibrant and in demand. The materials used implies a heavy Egyptian sway — most likely relating to superior quality, availability or simply attractive wholesale pricing that couldn’t be beat. Ultimately, Cretan-based designs would make a distinct impression of their own that quickly spread throughout the region. Many of the best-known pieces are found at the Heraklion Museum, named for the present day Cretan capital. Priceless items include a gold bee pendant, polychrome Kamares vases, and a clay statuette depicting a Snake Goddess or high priestess. The museum also features the famous Bull’s Head Rhyton, showcasing the Minoans’ craftsmanship, combining both realism and animated stylization — as well as the ubiquitous taurine animal. Carved out of steatite (soapstone) with gilded horns and eyes made of red jasper, the vessel would have been used for decanting their renowned hooch during rituals and celebrations. Large Minoan towns featured multi-storied buildings and stone-paved roads shaped from blocks cut with bronze saws. The capital at Knossos is believed to have exceeded 100,000 inhabitants — an extraordinary population in the ancient world. The bustling metropolis even boasted an intricate drainage system using clay pipes, as well as possibly the world’s first flush toilets (with the help of gravity flow and buckets of water). One of the clearest indications of Minoan influence was the discovery of its writing system. Evans would ultimately discover over 3,000 clay tablets and seals with three distinct forms written on horizontal lines: Cretan Hieroglyphs, a pictographic script, and two other forms, which he dubbed “Linear A” and “Linear B.” The majority of found documents written in Linear A appear to have been used for administrative purposes such as recording inventory and census information. Although experts have only been able to decipher Linear B, that language emerged as an early form of ancient Greek. Although the Phoenicians are credited as the oldest verified alphabet (and its derivative scripts of Greek and Latin), the Minoan writing system preceded the former Middle Eastern Kingdom by over a millennium. As every fashionista knows, style is everything — regardless of the era, environment or reigning house of design. People depicted in Minoan art clearly illustrate the importance of one’s appearance, and look nothing like the sloppy, toga party drunks from the movie Animal House. Men wore neatly constructed loincloths and kilts, promoting an air of self-confidence and an emphasis on comfort in the warm Club Med climate. Women flaunted a variety of sewn garments such as blouses and layered skirts displaying symmetrical geometric shapes. Remarkably, clothes were shaped to the body using a strapless, fitted bodice to accentuate their breasts, and both sexes wore tight belts made of metal to achieve a desirable small waist en vogue at the time (and still is). Incredibly, the styles worn in Crete would appear to mirror modern French fashions over 3,500 years later, prompting archeologists to dub an excavated Minoan painting, “La Parisienne” (the woman of Paris) replete with dramatic eyes, ruby red lips, and black cascading curls. Although a high ranking monarch or religious figure would have served as the de facto ruler on Crete, the Minoans political power structure differs sharply from other ancient societies. Based on archeological discoveries at sites such as Knossos, Phaistos, and Malia, the centrally located palace seems to have provided a royal residence in addition to hosting ceremonial rituals and administrative functions. The high number of major settlements throughout the area also suggests more of a bureaucratic decentralized government. The possibility of gender equality provides another stark contrast to other civilizations that preceded and followed. We know they worshipped several prominent goddesses unique to their culture, leading some historians to speculate they may have been a matrilineal society. Furthermore, women depicted in Minoan imagery are typically seen as glamorous, confident and frequently appear next to men on even footing. The absence of warlike themes or weaponry found in burial plots gives additional support to this theory. While no definitive proof exists to support the notion of women in Crete holding leadership roles, it’s worth noting that females appear to have more freedoms than those elsewhere during the same time period. By comparison, the Mycenaeans typically depict women within the context of the family structure, nurturing children and other domestic endeavors. Emperor Nero purportedly hosted wild orgies inside a rotating chamber at his Roman villa. Elvis partied hearty in his quaalude-inspired Jungle Room at Graceland. But “The Throne Room” at Knossos would set the tone early for livin’ large in the Bronze Age. Found deep within the biggest Minoan palace ever built, a sunken alcove featured a purification tank, decorative griffins and intricately carved and elevated seating — creating a high standard by which all future monarchs, drug kingpins, and rock stars would be measured — shark tanks notwithstanding. First discovered in the 1870s and later purchased by Evans in 1900, the Palace of Knossos served as the ceremonial and political center of Minoan society and is the oldest architectural monument in Europe. The elaborate complex spanned over 226,000 square feet and contained a labyrinthine configuration of over 1,400 rooms plus courtyards and corridors. Not surprisingly, the swanky spread dripped with opulence and showcased works of art destined for world-class museums. The architects designed the airy layout, using highly advanced construction techniques to take advantage of the abundant natural lighting and seasonal events; adding to the extravagance, a grand staircase led to multiple levels. A series of fires and other catastrophic natural disasters would destroy the original foundations, but the plucky Minoans kept rebuilding it, stacking more sumptuous layers along the way. And with more rooms than Caesar’s Palace (the one in Rome — not Vegas) the lavish manor bristled with activity day and night until its eventual demise in 1350 BC by yet another fire and the abandonment by its new owners — aka the Greeks. 4. Disaster Strikes. Again. And Again. The demise of the dynasty remains a debatable topic for historians and archeologists alike. Although strong evidence points to a hostile takeover by the Mycenaean Greeks in the mid-15th century BC, the locals constantly faced a much a bigger threat than invaders dressed in bed sheets: MOTHER NATURE. In fact, a series of catastrophic events may not have only ended their fun in the sun, but radically altered climate worldwide and even spawned the fantastical, please-be-true legend of Atlantis (and assorted biblical tales, too!). Commonly known as the “Minoan Eruption,” the island of Thera (today’s Santorini) experienced what many geologists refer to as the largest volcanic eruption ever witnessed. Unfortunately, written documents at the time remain sketchy (see #8 on this list), a reasonable guesstimated places the calamity taking place sometime in the 17th century BC and located about 68 miles from Crete. A conspicuous lack of human bones on Santorini hints that evacuations took place prior to the rupture, sparing thousands of lives. Nonetheless, the rumbling most likely triggered a chain reaction of highly destructive tsunamis, earthquakes, and fires. Just how powerful was it? The Volcanic Explosivity Index (VEI) registered 7 out of a possible 8, and released the energy of several hundred atomic bombs in a fraction of a second, making the atomic bomb dropped on Hiroshima look like a wet firecracker. Unquestionably, the eruption held the potential to cripple a naval fleet and flood coastal settlements; additionally, colder temperatures caused by massive amounts of sulfur dioxide and ash into the atmosphere would have had led to prolonged food shortages from ruined harvests. The swift decline of Minoan significance later morphed into a story concocted by the Greek philosopher Plato, who described a wondrous underwater empire located somewhere deep in the Atlantic. The world-changing event may have also found its way into the Old Testament and its stories of biblical plagues and the Moses-led exodus from Egypt. One of the more celebrated frescoes found at the Knossos excavation shows three young acrobats of uncertain gender engaging in a daredevil sport that involved somersaulting over the back of an enormous charging bull while using its horns to catch big air. Dubbed the “Toreador Fresco,” it’s an astounding sight on many levels — not the least of which denotes an activity or holy ritual requiring athleticism, courage, and participants who were clearly bat-sh… stuff… crazy. The stunning motif is far from the only representation of the bull-mad culture found throughout the island. Taurine tumbling can be seen on numerous other mediums, including other frescoes, drinking vessels, and burial tombs. There’s even a sculpture (now on display at the British Museum in London) in which a jumper appears to be doing the Fosbury Flop over a bull. Olé! Some scholars have theorized that the spectacle might have been sacrificial in nature (bull or man — take your pick) or an early form of bullfighting. Conversely, others have questioned whether the stunt is even humanly possible. Although a type of “bull-leaping” actually still exists today in parts of Spain and France, nobody dares to put their hands on the horns of a two-ton beast. And as for modern day matadors, the barbaric bloodsport features animals already bleeding to death and heavily compromised before a well-dressed butcher in tights and a silly hat steps into the ring. 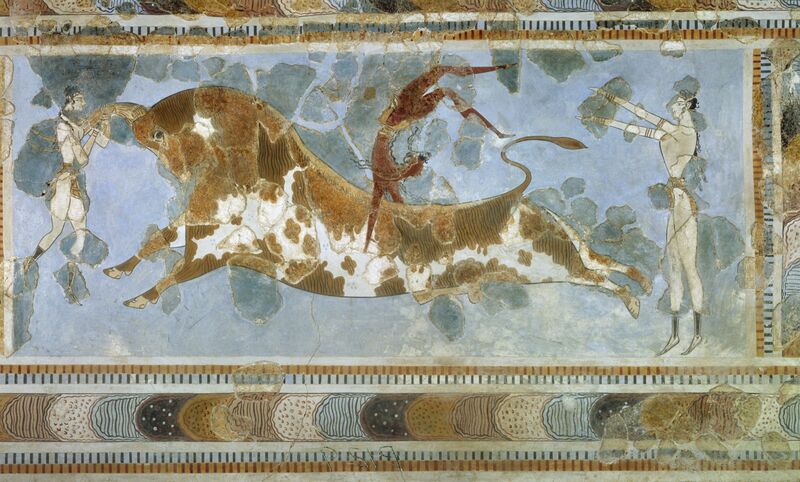 So in summary, sports fans, Michael Jordan might be the greatest Chicagoan (Bull) of all time, but any man or woman who laced up for the Minoan Bulls deserves the highest praise. The diverse landscape of Crete with its mountain peaks, fertile valleys, and natural harbors provided ample sustenance for the entire island and its surrounding communities. Recorded inventories indicate they raised a wide range of livestock, including cattle, pigs, sheep, and goats. As a result, this required a substantial amount of arable land for growing feed crops in fields plowed by donkeys and oxen. This demand helped pioneer a system of polyculture in the region — the practice of growing more than one crop at a time. As their population grew, so did the variety, leading to greater commerce and an expedited delivery system rivaling Amazon. The Minoans enjoyed a healthy diet centered around staple crops like wheat and barley, along with a wide range of fruits and veggies such as peas, lentils, figs, olives, grape, apples, pears, and pomegranates. Their well-rounded catalog ranged from utilitarian timber to the therapeutic (and extremely valuable) multi-purpose spice, saffron. Perhaps the core element of the Minoans’ high quality of life can be attributed to its copious production of oils and prized wines. They possessed sophisticated vinification skills and benefitted from one of the first wine-presses ever built. From well-maintained records, we know that vast underground storage facilities were used, providing further evidence of wine’s valued role. Later, Greek and Roman authors praised Cretan wines as being revered throughout the Mediterranean. Furthermore, the Bible states that Jesus turned water into wine with his first miracle — and given his divine powers, we can safely assume he uncorked the good stuff from Crete. Using tall, sturdy cypress trees, shipbuilders constructed a variety of naval vessels and are believed to have invented the keel. The larger ships stretched over 100 feet in length and used both sail and oars for propulsion; at sea, the Minoans relied on their navigational expertise and knowledge of celestial bodies and currents to guide them in challenging waters. Also, because they’re Minoan after all, the boats looked good too, featuring images of blue dolphins and colorful seabirds. A wide selection of top shelf, Made In Crete goods made for lucrative trading along well-traveled shipping lanes; this also allowed them to import luxury items like ivory and precious metals which they fashioned into fine jewelry. More importantly, however, the Minoans traded for copper and tin to make bronze tools and nautical equipment — an essential component for maintaining and expanding their command of the seas.